Phenom Gallery continues to its fantastic line of officially licensed NBA screen prints with this awesome Miami Heat screen print by artist M. Fitz, which celebrates the franchise’s greatest player, Dwyane Wade, and his amazing career! 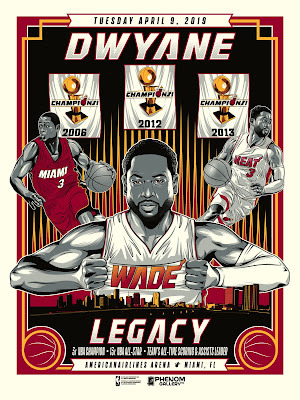 This print will go on sale tomorrow, Tuesday, April 9th, at the American Airlines Arena and TheMiamiHeatStore.com in honor of Wade’s final regular season game as a member of the Miami Heat vs. the Philadelphia 76ers. The Miami Heat Dwyane Wade Legacy Last Game Screen Print by M. Fitz is limited to just 333 prints, and will come signed and numbered by the artist.